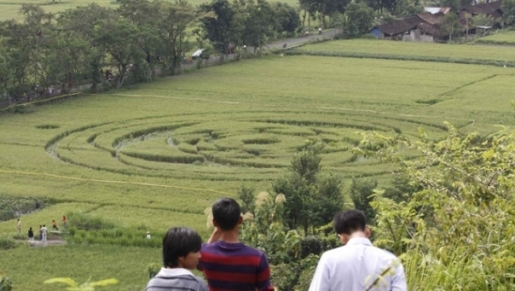 When crop circles were discovered in an Indonesian town, it became a sensation. Was Indonesia playing host to aliens from another planet? The crowds came to gawk at the circles and ponder what it all means. The crop circles appeared basically overnight. Just as quickly, experts have struck out at the crop circles, saying that Indonesia’s crop circles in the town of Slemen are man-made and not extraterrestrial in origin. The crop circles, which measure 230 feet in diameter, have become something of a tourist sensation for Slemen. The crowds are difficult for local police to control and one person has died after slipping and falling down the muddy slopes leading to the field. No doubt that death has something to do with the reason why officials want to debunk the crop circles so quickly.